From nationwide chains of Mexican restaurants turning out millions of tasty tacos a year, to smaller multiple-outlet fried chicken spots with that sweet and spicy Southern flavor, successful QSRs are owned and operated by men and women who know what it takes to attract customers, and more importantly, keep them coming back – day after day, month after month and year after year. The QSR owners of North America may not share much when it comes to management style or opinions on how salty to make their French Fries, but one thing they DO all have in common is a profound understanding that in-store music plays a vital role in the growth and long-term health of their business. 1. Music is the unsung hero of a successful QSR. 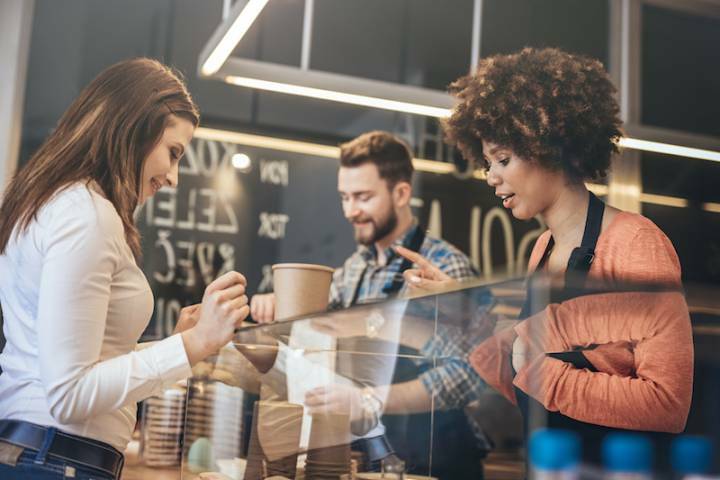 Often the last thing people reference when listing reasons why they love coming back again and again to their favorite QSRs, music nonetheless is an important part of the casual dining experience. In-restaurant music makes both a first and last impression – creating an inviting, familiar feeling when a diner enters and producing songs that stay in their head long after they leave. If this music, plus everything played while the diner is inside the QSR, is enjoyable then so to is the customer experience. 2. Music is also one of the best ways to build customer relationships. Whether a customer realizes it or not, when she walks into a QSR for the second, fifth or two-hundredth time and hears a familiar song or music genre (that has been specially selected for the restaurant) that she has heard there before, it evokes a highly comforting sense of the familiar that connects her to that brand. In the same way returning home after a long absence and immediately getting a whiff of Mom’s pie makes people feel at ease, so too does that familiar style of music associated with the QSR make customers feel relaxed and cared for while dining there. It’s a strong bond and one that is made entirely by music. 3. Great music doesn’t mean a thing without the proper equipment. A QSR could have the world’s most perfect music mix, but if the restaurant uses outdated, tinny speakers it will sound like the 3rd Grade band class from PS84 up the street. QSR owners who have mastered the world of in-restaurant music have also invested in quality speakers that deliver top notch audio, as well as streaming devices that ensure the music will play on without interruption caused by data hiccups. 4. To implement the best in-store music program, you have to work with a professional. Partnering with a business music provider for in-store music is the best way for QSR owners to enjoy a successful in-store music program. Many QSR owners, being the entrepreneurial sort, may have even tried to do it themselves. But spending the weekend loading up the family iPad with favorite songs, and hooking the device up to the Bluetooth speakers Jimmy left behind when he went to college just isn’t going to do the job. Professional music experts for business create easy-to-implement programs that sound great and always deliver the right tunes at the right time. To get the tastiest in-restaurant music for your QSR or individual restaurant location, visit Cloud Cover Music today. Cloud Cover Music has helped eateries of all kinds across the United States and Canada implement affordable and convenient music programs for their business. To start getting the best in-store music for your QSR, visit the Cloud Cover Music website and sign up for a 14 day FREE trial of the same services that have already helped restaurants like yours enjoy the benefits of in-store music.